This Kiwi Can Fly: Four Croak-o? Did I ever tell you about the illegal drink I had? If you read the international news sites, you may've seen some recent discussions on California's status as a nanny-state. America is a bit of a confused country right now. It seems to be swinging between the laissez-faire, survival-of-the-fittest, step-over-the-bodies-of-the-poor attitude, and the sort of pointless meddling in people's lives that would make Tony Blair blush. Frankly, I think the whole country needs to sit down with a psychiatrist. And a financial planner, for that matter. They recently banned toys from McDonald's Happy Meals, to try and lower childhood obesity. 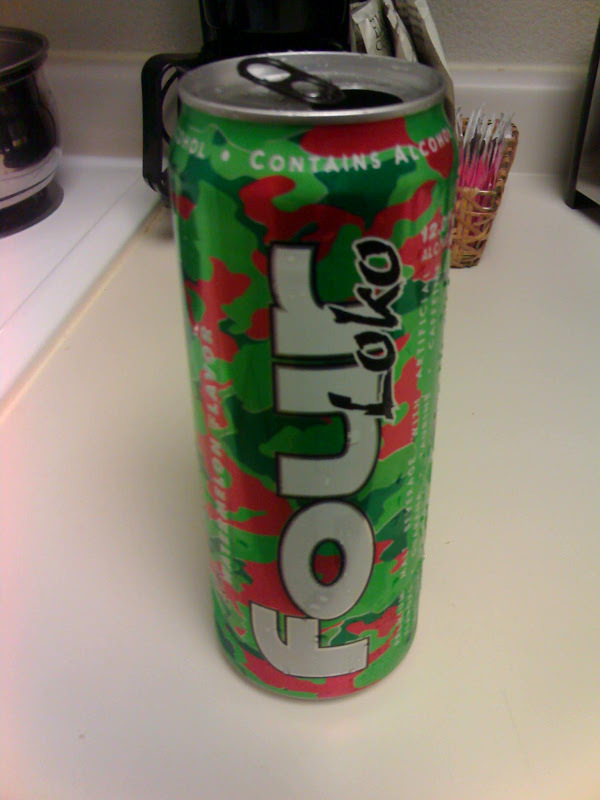 They banned a drink called Four Loko, because it killed a bunch of teenagers. I love you, my loyal readers, but there is no way I'm eating a Happy Meal for you. So that leaves us with the Four Loko experience. Luckily, I was stuck in California for a couple of weeks in October just before the ban came into effect. In another example of American confusion, in the hotel where I stayed you're allowed to smoke, but you aren't allowed alcohol. So I had to smuggle it in. I live life on the edge, baby. Four Loko comes in a huge can (I think it's about a pint). The drink is 12% alcohol, and full of caffeine. As you can see from the photo, the one that I had was the delicious-sounding watermelon flavour. I asked an American in the know where I should go to buy one, and he said "Find a liquor store with a bunch of hobos out the front", so I did exactly that. It was very cheap; I think it was under $2 for the can. It was apparently the drink of choice of the homeless, but it was only when rich kids at parties started drinking it and dying that it became a problem. Proponents of Four Loko point out that it's not really offering anything different to a Red Bull and vodka, it's just in a massive volume, and very cheap. Which is probably the problem. I think I can honestly say that I've never tasted anything so horrible. I didn't get through much of it before pouring the remainder down the sink. It was like watermelon-flavoured turpentine, only worse. I wouldn't ban it to protect stupid college kids, but I would ban it for epicurean reasons.